This book aims to cover all the GCSE Physics material needed to meet the specifications of the examining boards Edexcel, AQA, WJEC and OCR (both 21st Century Science and Gateway) both for single and double awards. 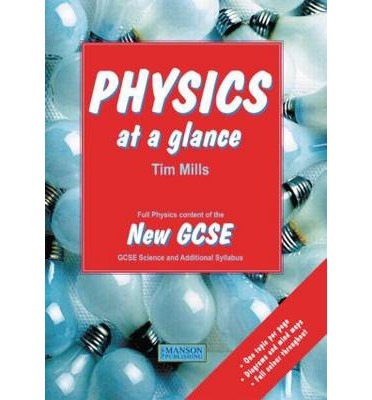 The content also covers the additional topics necessary for the Physics GCSE single award. It is the third book in the series following 'Biology at a Glance' and 'Chemistry at a Glance' and it encourages learners to use a mind mapping approach to revision. Just like the other books in the series, each page contains clear annotated illustrations that will help the reader to assimilate the facts quickly and commit them to memory. The book covers force and energy, energy and its transfer (including waves, electrical and thermal energy), electromagnetism and radioactivity. It goes on to describe a wide range of the practical applications of physics and concludes with material on our place in the universe. To comply with the latest GCSE specifications, 'How Science Works' permeates all aspects of the book which also provides questions on all the topics covered, to reinforce skills and understanding.